Lota James (#5) gets up at the wire over Diva Candy Girl (#6) in the $17,500 Dash In A Flash Stakes Saturday afternoon at Canterbury Park. SHAKOPEE, MN�JULY 15, 2017�Lotta James, who two races back started for a $12,5000 tag at Remington Park, prevailed over Divas Candy Girl to win the $17,500 Dash In A Flash Stakes Saturday afternoon at Canterbury Park. Posttime-favorite Bye Byefreighttrain finished a neck back in the blanket finish to take third. Ridden by jockey Nik Goodwin, Lotta James scooted over the 110 yards in a quick :6.987 clocking into a 15-mph headwind to earn a 98-speed index. It was the fifth career win in 17 starts for the son of multiple stakes sire IVORY JAMES. 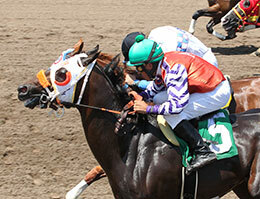 Saddled by trainer R. Allen Hybsha, Lotta James picked up $8,850 to boost his career mark to $46,044. The brown gelding races for owner Whiting Ranch. Steve Holt bred Lota James in Oklahoma from the Shazoom mare Lotawatah. Diva Candy Girl, a stakes winning sister to four-time champion Spit Curl Diva, picked up $3,540 for her second-place effort. Jason Olmstead conditions the filly for owner Thomas Scheckel. Carl Pevehouse and Ezra Lee bred Divas Candy Girl in Oklahoma. Danny Velazquez rode the earner of $83,075. Kasey Willis saddled Bye Bye Freightrain to his third-place effort for owner/breeder L.P. Frank. Also, an Oklahoma-bred, the graded stakes winner was ridden by Cristian Esqueada. The $2,655 third-place check boosted Bye Bye Freightrain's earnings to $240,153. Fast Eddys Eyeinyou, Dash For Number One, Ms Dynasty, Iowas Texan Tip and Fast Prize Janie completed the field.